Identical tables may be confusing. 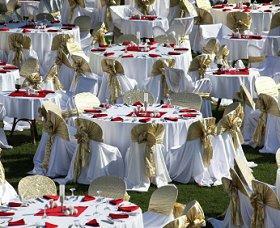 Decorating each table differently is possible for a wedding reception. This decorating choice creates a unique and personalized touch that some couples prefer. Follow a few tips to prevent your creative fun masterpiece from looking haphazard. Decorating tables differently at a wedding reception can give your celebration a unique appeal without sacrificing beauty and elegance. Uniquely decorated tables also eliminate the need for large table numbers or other labels to help guests find their assigned seats; they can simply be directed to the proper decorations. Tables can be coordinated with different aspects of the wedding theme, bringing together the entire look with flair and allowing couples to select a wider range of decorations than just one design. Decorating each table differently can be a challenge, however. If the decorations are too unique, the reception can look thrown together rather than carefully crafted around a central theme. Depending on who is doing the decorating for the reception, costs may be higher than if a single design is used - many linen rental agencies, for example, have minimum requirements that may not be met if multiple colors are needed. It can also be a challenge to ensure that not only is each table distinct, but that each one coordinates with the wedding colors and overall theme. With more options in use, there is more opportunity for discord. High-Low Centerpieces: Different sizes of floral centerpieces can give each table a unique look, and the easiest way to do this is with different heights. A tall centerpiece must have a thin base that won't inhibit conversation, while low centerpieces can work best on larger tables where they won't crowd place settings. Changing Flowers: If the bride carries a mixed floral bouquet, different centerpieces can be designed around the individual flowers in her bouquet. This will connect each centerpiece to the bride's bouquet but will still let each one be unique. Flower Colors: Using the same floral centerpieces but in different colors is an easy way to adjust table decorations. For example, every centerpiece may be made of roses, but different centerpieces may be white, yellow, pink, or red depending on the wedding's color palette, yet they will all coordinate with similar sizes and shapes. Small Plants: Instead of floral centerpieces, couples can use a range of small plants to decorate each table with unique touches. Bonsai trees, small topiaries, or lucky bamboo plants can be stunning and distinctive choices. Fall Leaves: For a fall wedding, couples may decorate each table differently with different types of foliage. Oak, maple, and elm are popular options, and scattered leaves on the table or incorporated into the centerpieces add unique seasonal flair. Photographs: Photos of the happy couple can be used to adorn tables as romantic centerpieces. A couple may use their school photos, engagement pictures, or fun snapshots of their relationship, but each photo should be the same size and similarly framed for a coordinated look. Different centerpiece heights can be distinctive and elegant. Antique Vases: For a rustic, casual look, using different vases for the table centerpieces can help each table look subtly unique. Different milk glass vases are also popular for spring or garden weddings. Destination Themes: For a fun and creative option, couples may theme each table to one of their honeymoon destinations or a place they hope to travel together. For a beach wedding followed by a cruise honeymoon, for example, different tables could be labeled Jamaica, Cayman Islands, and Bahamas to represent ports of call. Linen Colors: For a simple way to decorate tables differently, couples can choose different linen colors. For a Christmas themed wedding, for example, each table may have a white base tablecloth but accent colors could be red, green, silver, gold, and ice blue for different tables. By keeping these items the same, it is possible to decorate tables differently but still have a cohesive and elegant décor. While decorating each table differently for a wedding reception, it is important to keep in mind how each table will relate to the head table, which is typically the most lavishly decorated. If different colored flowers are used for each smaller table, for example, the head table should incorporate all the colors. By keeping the head table as the most elaborately decorated, it becomes a focal point of the reception and there is no mistaking who is seated there. Consider using only a few variations in décor rather than having each table completely unique. This will give the reception an even more coordinated look while still retaining individuality. Even if the tables are uniquely designed, it is still wise to have subtle place markers or table numbers available so guests do not become confused about where to sit. If the tables are strongly themed, include a place card explanation for each theme at the table. This can also provide a conversation starter for your guests. Decorating each table differently for a wedding is a way for couples to explore their creativity and develop their wedding theme in a stylish way. Unique tables can be lovely and will help make your wedding even more memorable.